It is June 1967, and United States military involvement in South Vietnam is nearing its zenith. 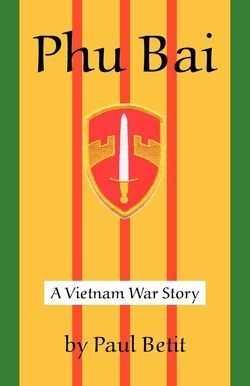 As the war ratchets up, John Murphy and Charles Van Dyck of the Army's Criminal Investigation Division investigate the murder of an American soldier at Phu Bai. War intrudes as the two investigators build their case against the most likely suspect. But a bizarre twist turns it into an unusual manhunt in the middle of a war zone. “This fast-paced murder mystery grabs readers early in the story. Filled with suspense throughout, this is a book you will likely to read nonstop.” Read complete review here. Here's what Maine newspaper columnist George Smith recently said about Phu Bai. "The pacing and the characters were right on the money and the outcome had some very unpredictable twists and turns. A first-rate read! Very enjoyable. And that is from someone who also writes novels and stories of this type." —Francis Hamit, Los Angeles, Cal. “The murder-mystery itself is well-written with an interesting plot, attention to detail and good character development, never mind the turn in the story that takes the reader and investigator by surprise. A well-done job of which (you) should be proud. By way of background, I arrive at Phu Bai in January 1967 and left in December of that year. Before that, I had been Commanding Officer of Company G, USASATR. My first assignment at Phu Bai was to lead the mortar platoon (mentioned on Page 55) and after the incident you described. I then commanded Company B. And then I was assigned as the PR&C OIC in the Operations Center. Your Captain Wolfe (which I assume to be Captain Larry Buffaloe, MP) was spot-on. Larry and I are still in communication after all these years. I got thoroughly caught up in the story and the astonishing detailed account of Phu Bai life as we lived it during ‘67-‘68. It doesn’t seem that long ago. I broke into an audible grin at the account of (Van Dyck) having purchased swimming shorts at the Indian’s gift shop. That was our Mini-Mall. Phu Bai was a welcomed diversion for a couple of days as I read the book with a relish. I am sure that my children will get the same enjoyment when they receive their copies. It will make talking to them about Vietnam a lot easier for me.